I had heard it only once before...last summer in the Boise foothills. The habitat on Antelope Island was right for it and the sound I was hearing was distinct. I had my son look it up on iBird and play the sound just to confirm. I was right! 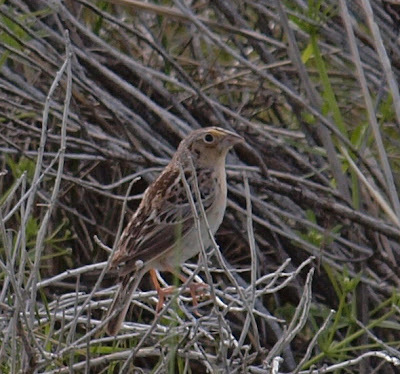 It was a Grasshopper Sparrow. Within seconds we found it trilling from the top of a sage brush right on the edge of the road. (Listen to the Grasshopper Sparrow) I'm not sure why the Grasshopper Sparrow song stuck in my memory so profoundly, and I was delightfully surprised that I recognized it. 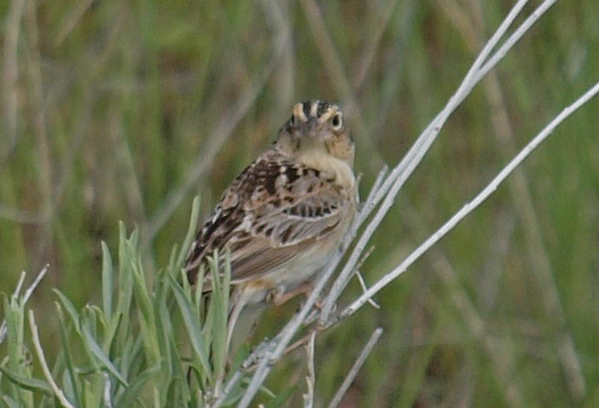 The Grasshopper Sparrow is not exceedingly common in the intermountain west, so it is a treat when you find its spring and summer haunts. See the Cornell and eBird maps below to get an idea of its range and migration pattern. The Grasshopper Sparrow is among the smaller of the sparrows; about the same size as a Chipping Sparrow in my experience. In the western United States, there aren't too many similar looking sparrows, but in the east an identification might be a little more challenging. The bold white eye-ring contrasting with the orange-brown cheek makes the eye appear proportionally large. The crown sports a white stripe down the middle with blacks stripes on either side and buff stripes outside of those. 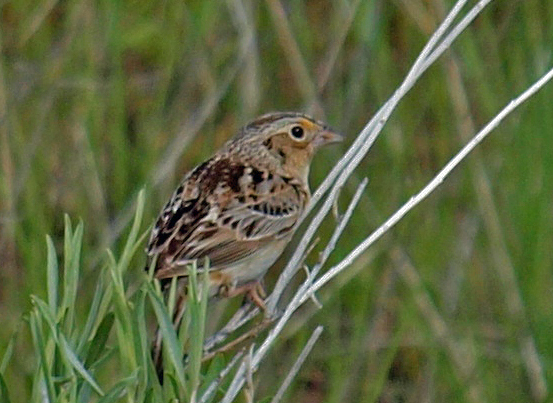 Adult Grasshopper Sparrows have unstreaked breasts and have an orange or buff appearance. The upper parts (mantle, back, and scapulars) are a splash of black, white, and various shades of brown and rust. In non-worn breeding plumage you'll see white edges on the coverts creating thin wing-bars. I think their head has a very distinct shape. The curvature of the skull continues straight into the bill without a break. The top of the bill is also darker than the rest of the bill. This head profile appears to be similar on most of the Ammodramus sparrows. There are a dozen subspecies of Grasshopper Sparrow, with four subspecies breeding in North America (AllAboutBirds.org). The most likely in the west, north of Arizona, would be the perpallidus* which, by definition of the classification name, appears "paler" than the other varieties. That description seems to match my photos when compared other photos and illustrations. I thought the name "Grasshopper" Sparrow referred to the sound it makes, but it turns out that it does eat grasshoppers too! 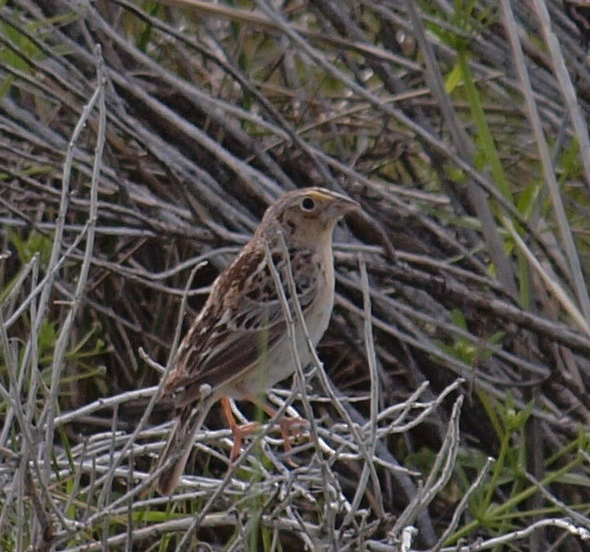 This was only my second ever sighting of a Grasshopper Sparrow and my first in the state of Utah. Pretty cool!